Today is the day of the inauguration, and I have never looked to an incoming president with so much unease and trepidation. Schools have an early dismissal, and most businesses are closing early in anticipation of protests expected to hit downtown. I’m trying to look on the bright side of things. There is a historic women’s march scheduled to take place in Washington tomorrow, and here in Portland, 35,000 women will gather to unify and empower people that stand for human right’s, civil liberties and social justice for all. It’s sad that such basic and fundamental rights are being questioned in our current society but the actions of the last few months have brought into sharp contrast how deeply divided this country is. As an individual, I realize that apathy isn’t an option and if I want to see a change, I’m going to have to participate. I’m looking into volunteer opportunities to support issues and organizations that I fear will be threatened under the new administration. Women’s reproductive rights and access to quality healthcare and education are at the top of my list. It also points out to me that we should appreciate what we have because we never know when it might be taken away. I have spent a lot of time the last few years focusing on what makes me unhappy and I’m trying to focus on the good in my life instead. To be honest, it was challenging to draw up a lot of enthusiasm for a recipe today. So I thought I’d share a favorite quick and easy recipe that I use when life gets the best of me. 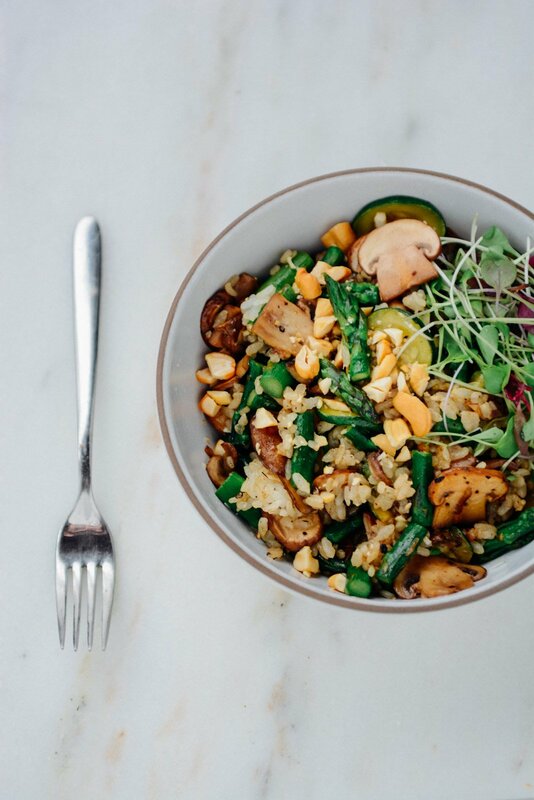 It’s perfect for using up whatever vegetables and grains you have languishing around in the refrigerator. 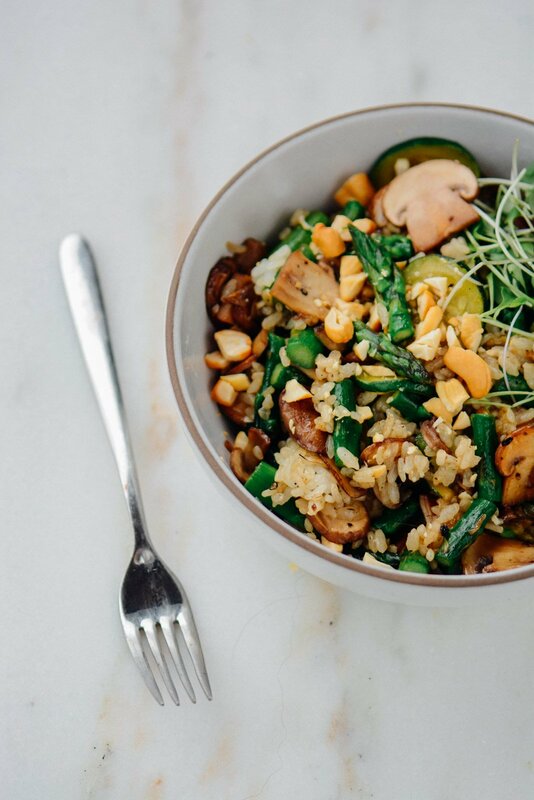 Quickly stir-fry some mushrooms, asparagus, and zucchini, add leftover rice and then coat them with a simple soy and sesame glaze. Day old rice works best when making fried rice but if you are prepping a fresh batch, spread it out on a parchment lined cookie sheet to cool quickly before adding to the skillet. Frozen works extremely well and Trader Joe’s has great frozen brown and jasmine rice. This quick and easy stir-fry can be ready in less than 30 minutes. 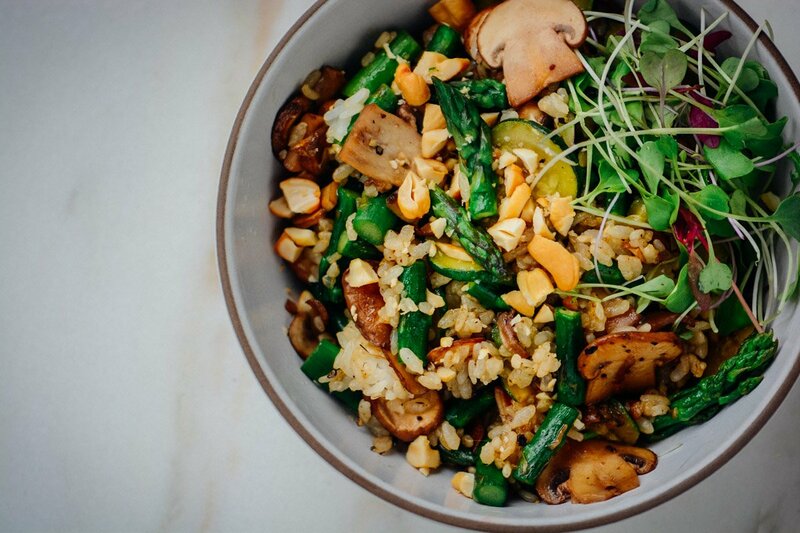 A quick saute of fresh veggies, and rice is topped with a soy and sesame glaze! Bring 12 cups of salted water to a boil in a large pot. Once boiling, add rinsed rice and stir. Boil on high uncovered for 30 minutes, then strain and return to cooking pot removed from the heat. Cover with a lid and let steam for 10 minutes. In a small bowl combine soy sauce, maple syrup, ginger, chili paste if using and sesame oil. Heat 1 tablespoon of oil over high heat just until it starts to smoke. Add the asparagus, mushrooms, and zucchini and cook stirring occasionally until asparagus begins to brown and the mushrooms release most of their liquid about 3-4 minutes. Add the rice and cook for 30 seconds then pour the soy sauce mixture over the top. Continue to cook for 1-2 minutes until asparagus is crisp-tender and the pan is mostly dry. 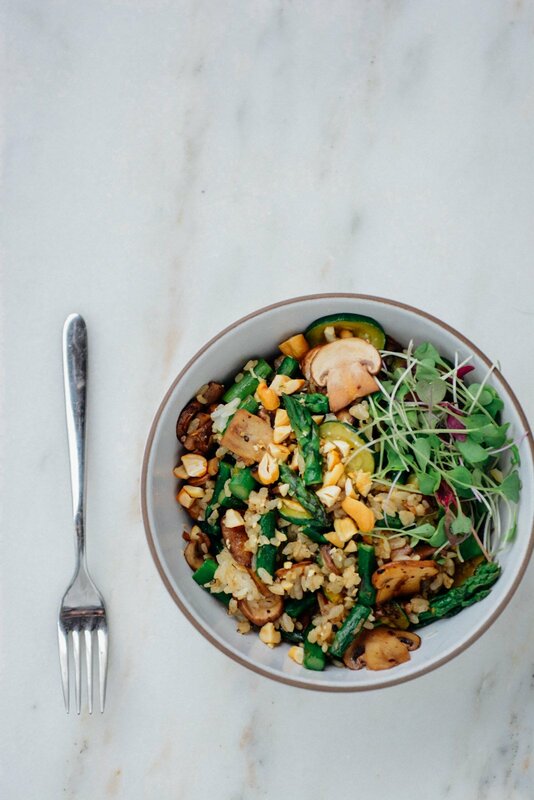 To serve sprinkle with the cashews and top with a handful of micro greens.